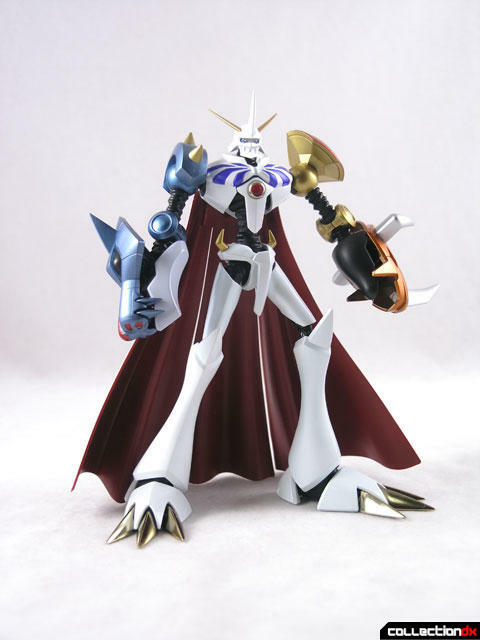 While typically I dismiss Digimon with other kid-centric anime shows like Pokemon or Beyblade, occasionally they have an actual cool design. 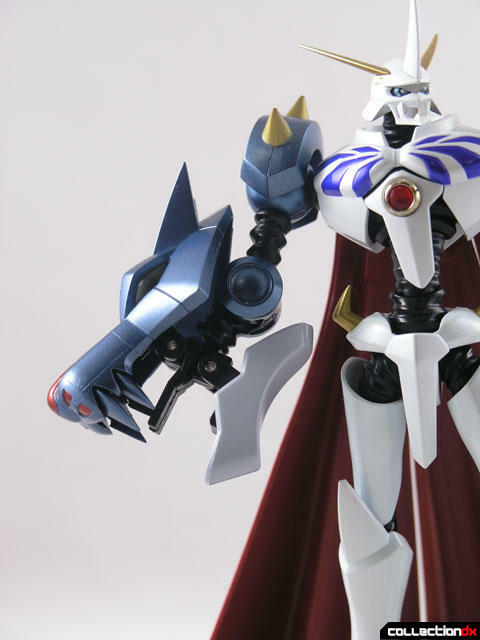 Digimon has also been around long enough now that the Japanese have become nostalgic for it, and as such, Bandai has begun making higher-end toys from the series. Digimon first premiered as an anime in 1999, but it’s origins go back to 1997 as a virtual pet similar to Tamagotchi. 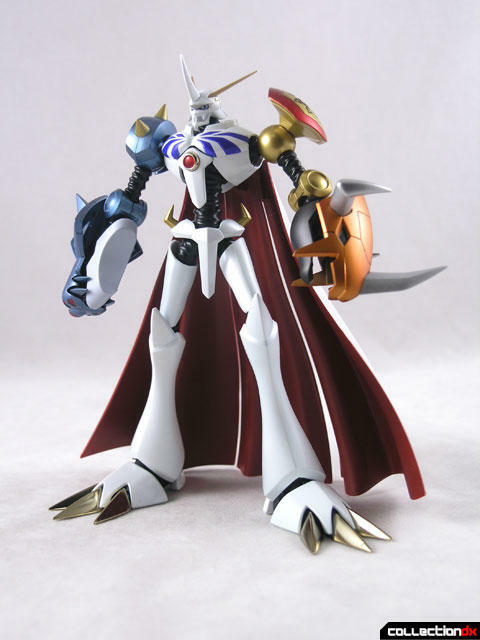 The whole idea of Digimon (Digital Monsters) are that these creatures Digivolve into higher forms, and some even combine into combined forms. 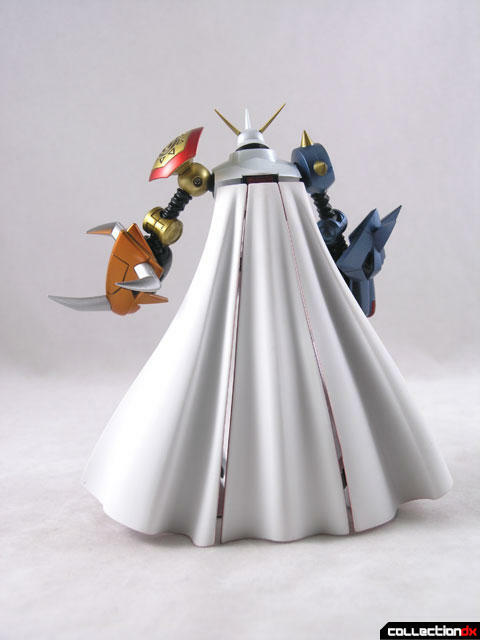 Such is the case with Omegamon. 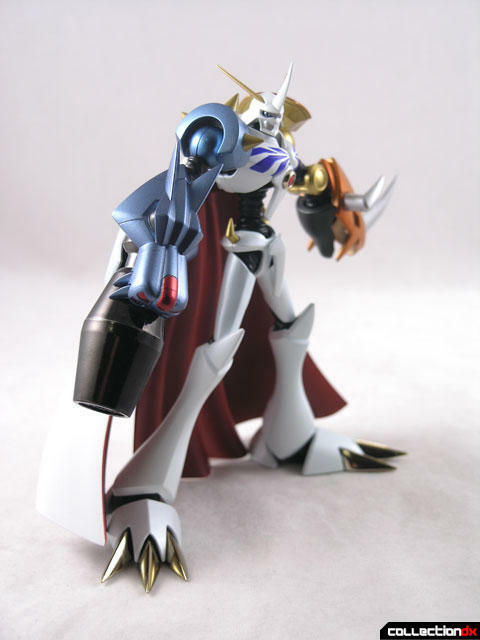 Known in the US as Ominmon, Omegamon is the result of the combination of two digimon - WarGreymon and MetalGarurumon. 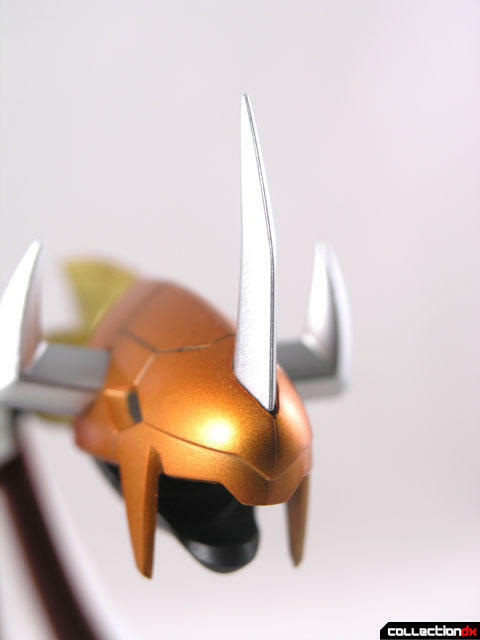 As a result his left arm has WarGreymon’s head and his right has MetalGarurumon’s head. 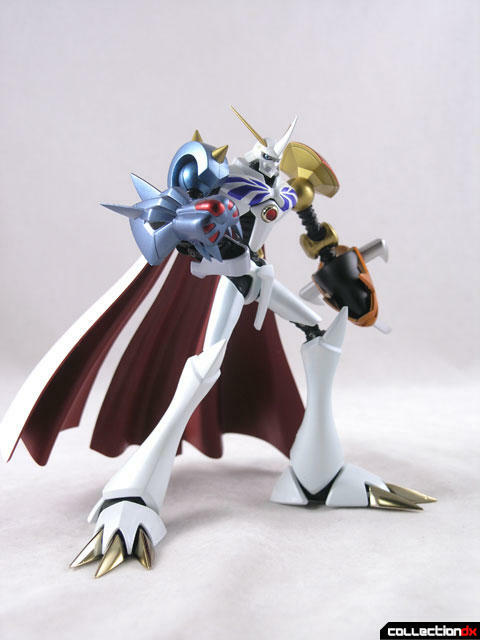 This combined character makes its first appearance in 2000’s “Digimon Adventure 02”. 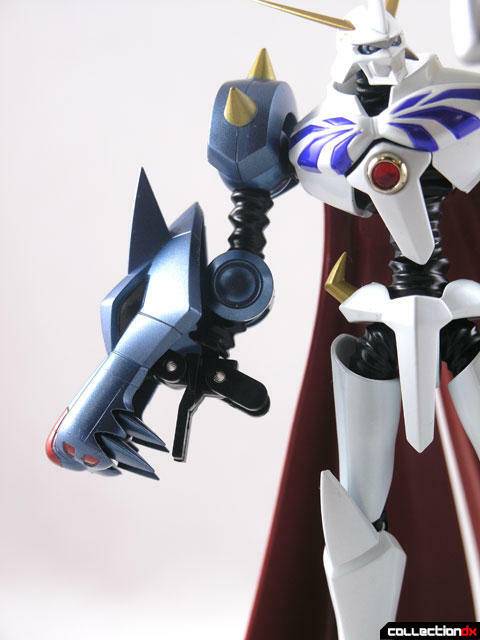 The toy is part of Bandai’s D-Arts line, which features characters from video game franchises (Hence the D in Digital). Considering how elegant the box is, you would never have thought this came from a kiddie show. 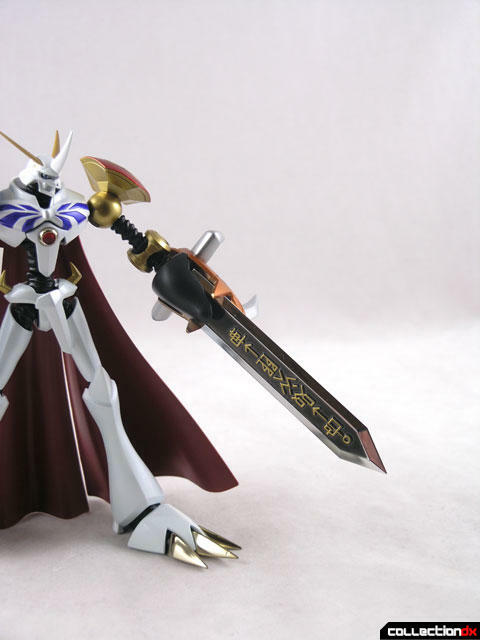 The die cut window and the glossy metallic script give this toy an air of nobility. Perhaps this show is seen differently in Japan? 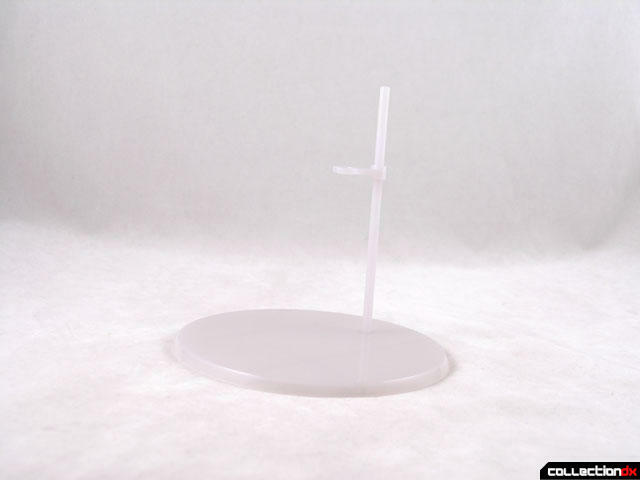 Inside you get a standard clear tray with the figure, accessories, and a stand. 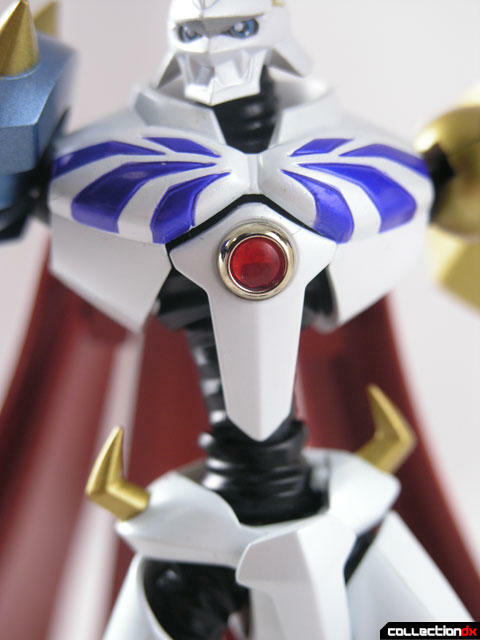 The figure is tall and nicely done. Once again I am surprised at the level of quality used on a subject matter like this. 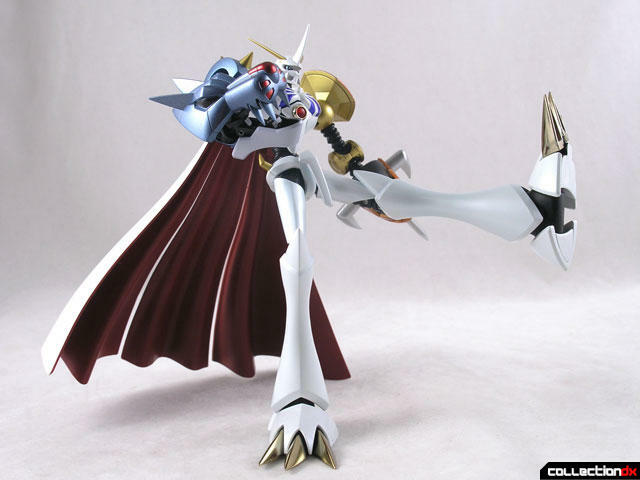 Its design is reminiscent of Getter Robo – namely Shin Getter 2, except with animal heads as hands. Articulation is great, and the big feet really give this toy great stability. The head is on a ball joint, as is the torso (which pops out maybe a bit too easily). The crest in the middle is also on a joint. 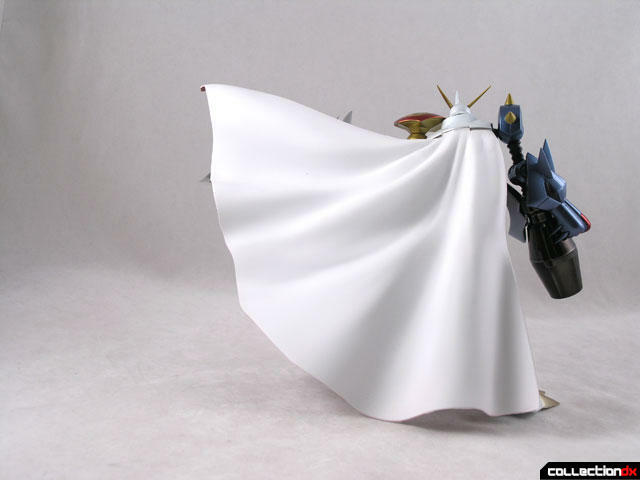 Two capes are included that can be attached to the back. One for mobility, one for beauty. 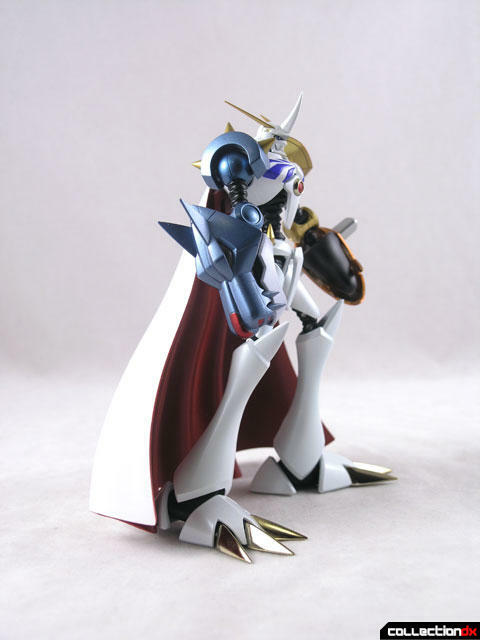 The mobility cape has several articulated sections for dynamic posing. 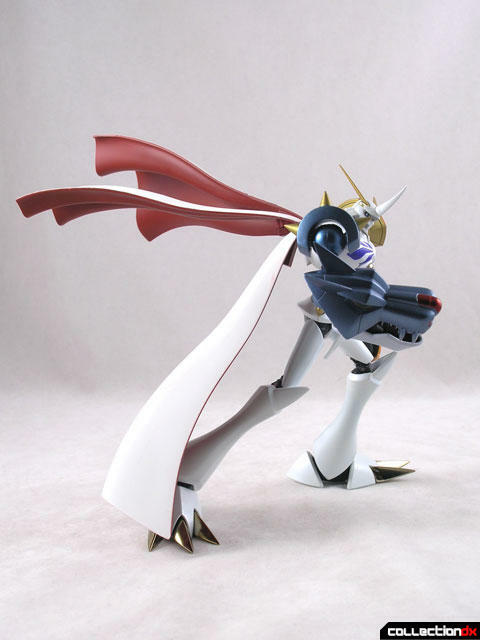 The static one is basically for one pose, with the left arm outstretched as it blows in the wind. The hips are ball jointed, the knees double jointed, and the ankles are ball jointed. Each metallic toe is individually articulated. 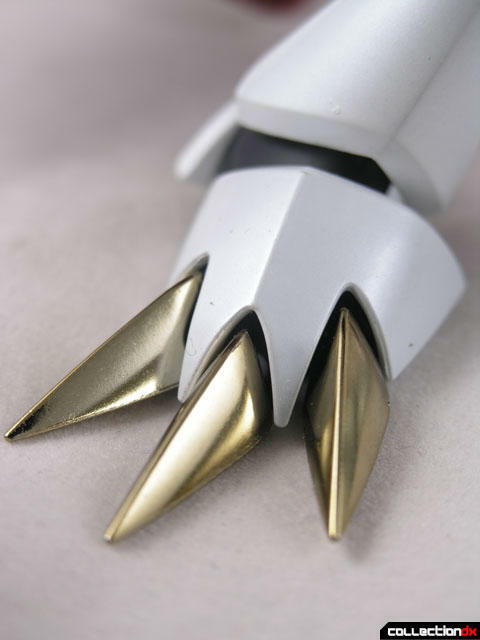 The left arm, featuring WarGreymon’s head can open and close, and inside you can plug in a beautiful chrome blade adorned with runes. 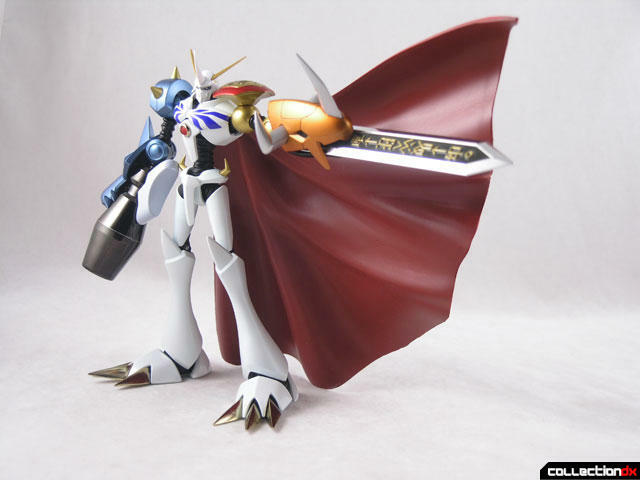 This blade is called the Transcendent Sword. 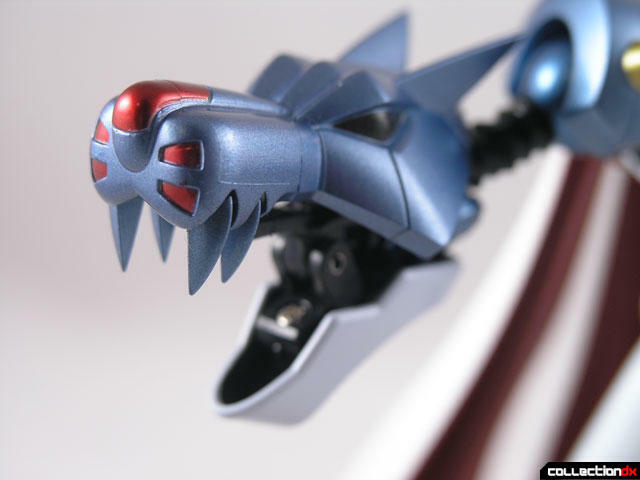 The right arm, MetalGarurumon’s head, can open as well. 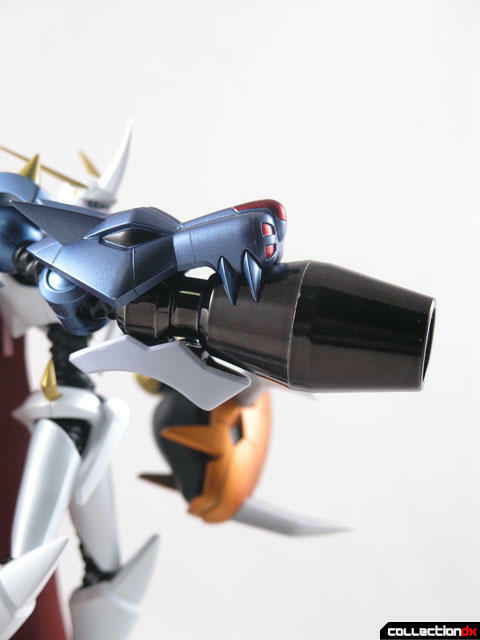 This one actually has two joints to expand to allow the Supreme Cannon to fit inside. The teeth are on hinges and will spread apart to accommodate the weapon. 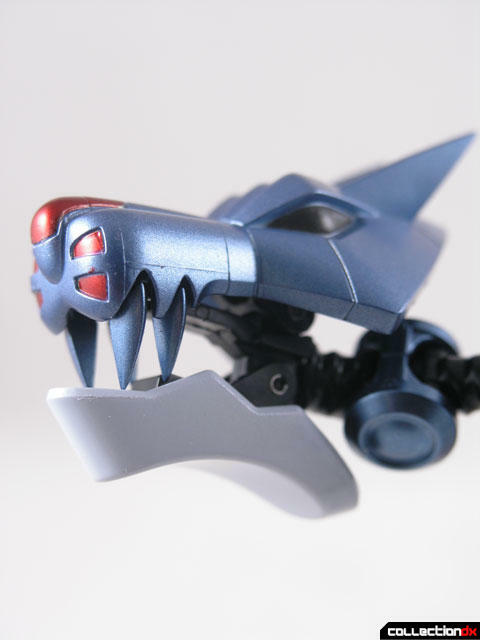 There is also a different lower jaw accessory for MetalGarurumon’s head but I am not sure of its purpose. 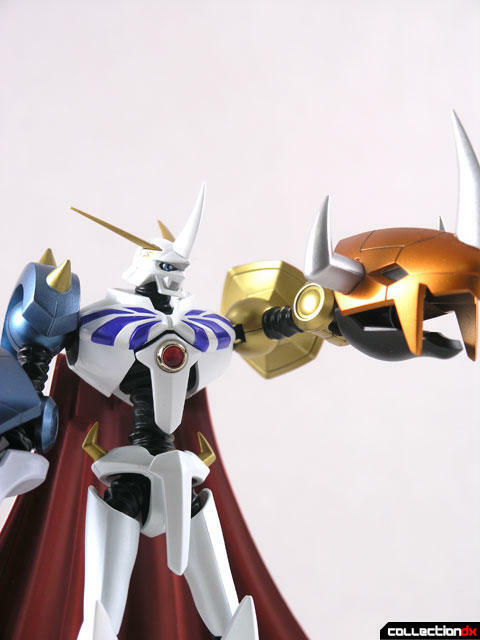 With both weapons armed, Omegamon looks awesome. 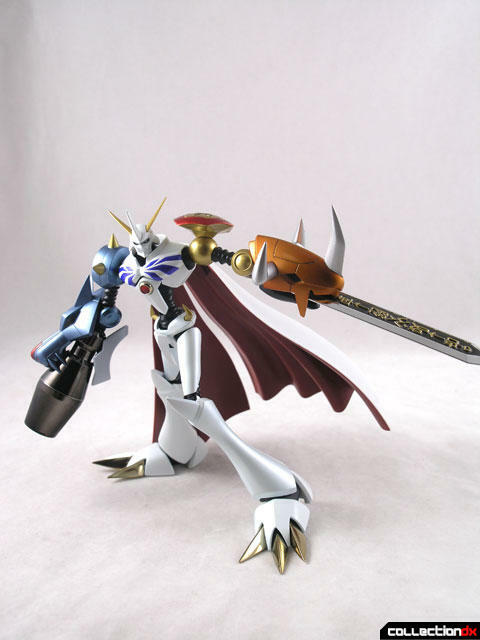 While Omegamon is compatible with the standard Tamashii Stands, a unique stand is also included. 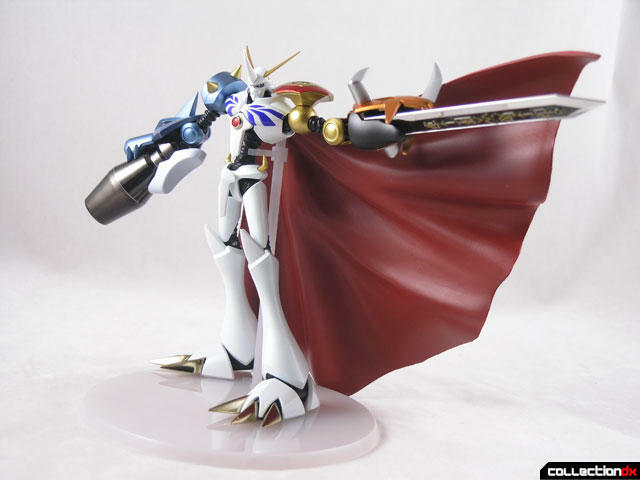 This stand is just a frosted base with a pole and a clip to make sure he stands – this does not support dynamic poses like a Tamashii Stand would. I have to admit, I am surprised at how much I dig this figure. 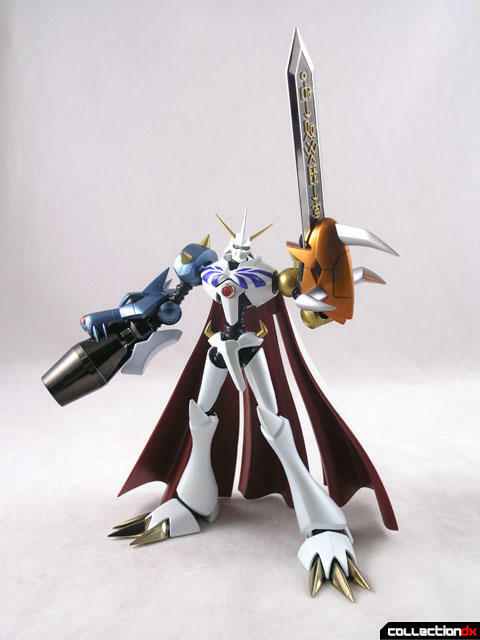 I’m not a Digimon fan by any means, but the toy looks pretty Badass on its own. I Agree, this guy looks great! 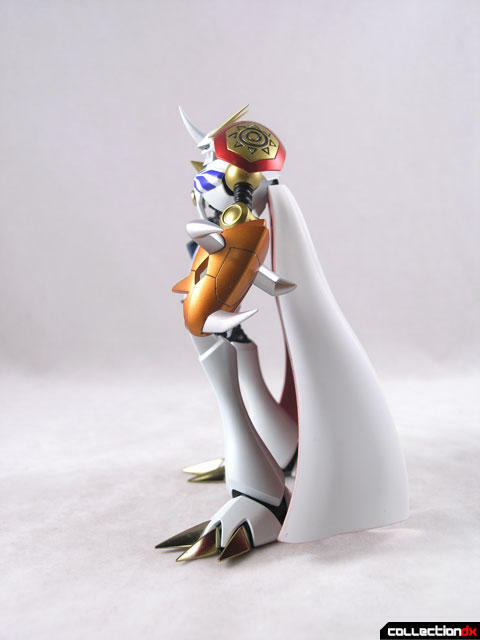 I think Omegamon first appeared in second Digimon movie (still falling under Digimon Adventurues 01), "Our War Game", seeing how much attention was given to his first digivolution... that was pretty incredible scene. 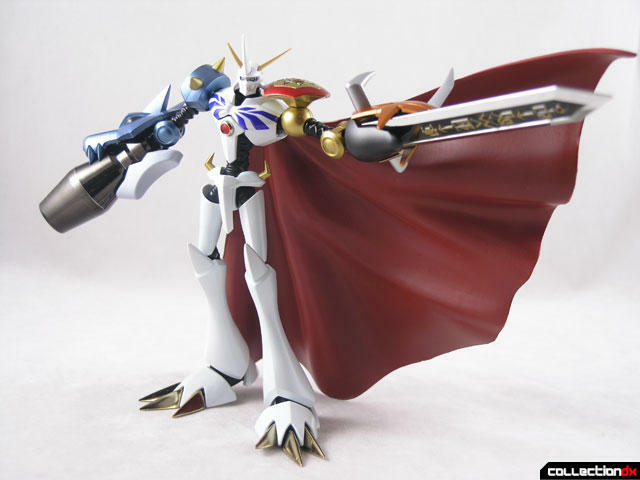 Very nice figure, I'd love to have it next to BlackWargreymon (another kickass chara, this time from Digimon 02) and (supposing they get released) Imperialdramon, Gallantmon Red Mode and Alphamon. 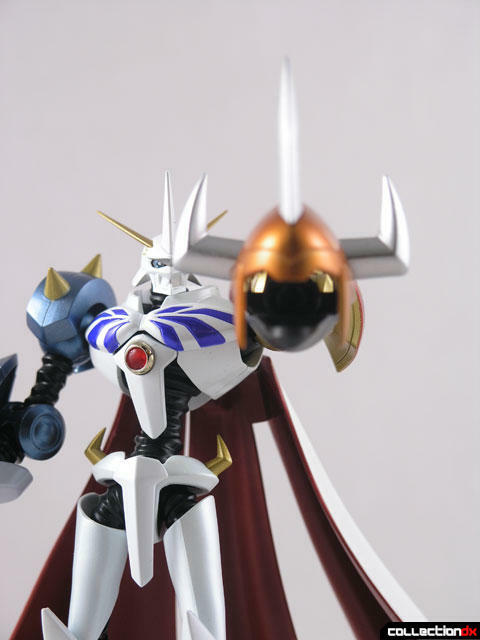 Yes, Omegamon first appears in "Our War Game". The movie's worth a mention as it was directed by Hosoda Mamoru, director of "The Girl Who Leapt through Time" and "Summer Wars". Heck, "Summer Wars" is essentially a remake of "Our War Game", just without the digimon. 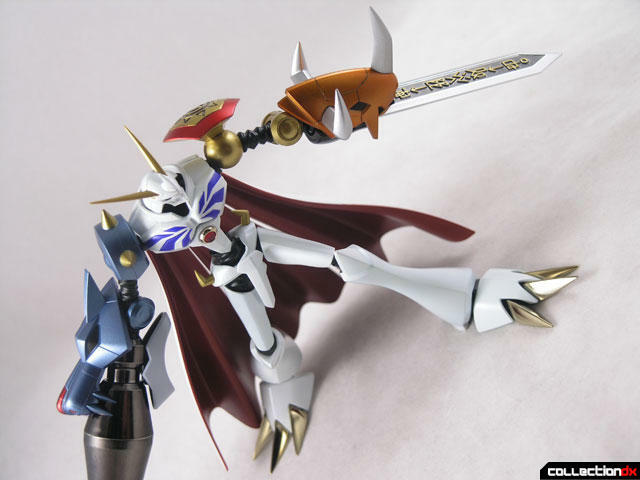 Digimon, by the way, has always been one of my guilty pleasures, at least regarding the first two seasons. 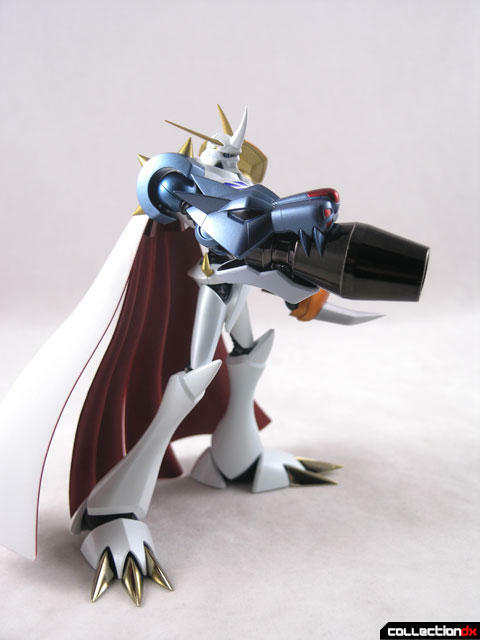 In Japan, the two weapons are called the Grey Sword and the Garuru Cannon, for obvious reasons. 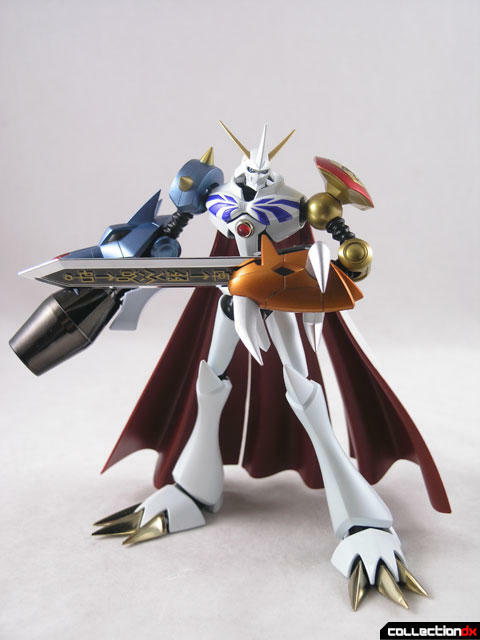 A bit more background info: Omegamon is a part of a fictional grouping of thirteen Digimon known collectively as the Royal Knights. 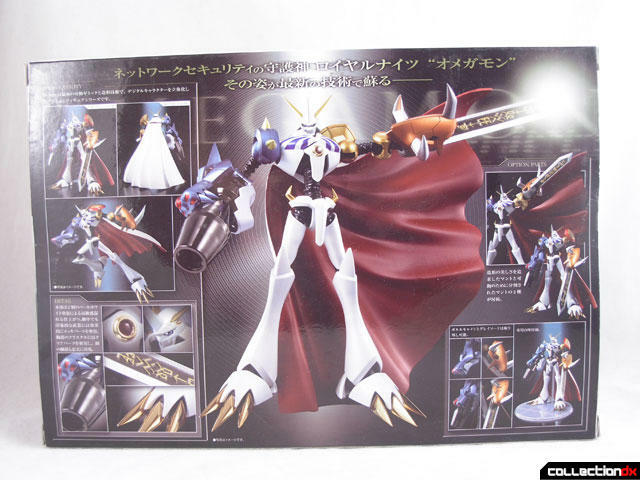 Because the official leader is missing in action extremely often, Omegamon is most often found in command. 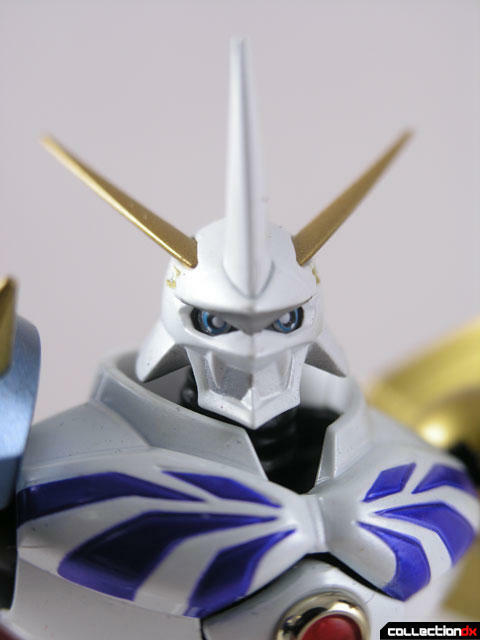 I know that applied to Digimon X Evolution movie where the said leader was in fact Alphamon with Omegamon and Dukemon as second in command, but not sure if that worked in the Digiminon 01 and 02 since Omegamon was a result of DNA digivolution and not a stand alone character there. True, but I'm referencing the background material that is provided by Bandai, who produces the promotional merchandise, such as trading cards and video games, rather than Toei, who produces the anime and movies. 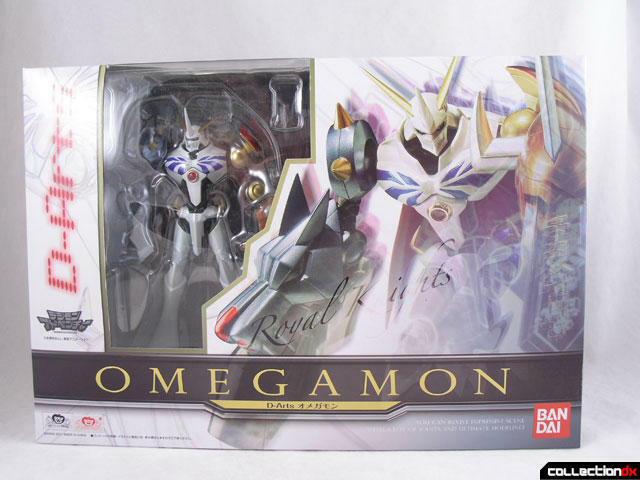 Finally, correct me if I'm not mistaken, but didn't Omegamon show up in season 5 of Digimon? This is totally unrelated, but Josh do you just not check the emails often or just get too many to keep up with, or is the contact form not working? Cause I sent an email through that about possibly doing some reviews, and I don't recall exactly when, but it's been way longer than the timeframe I'd expect to get a reply in.